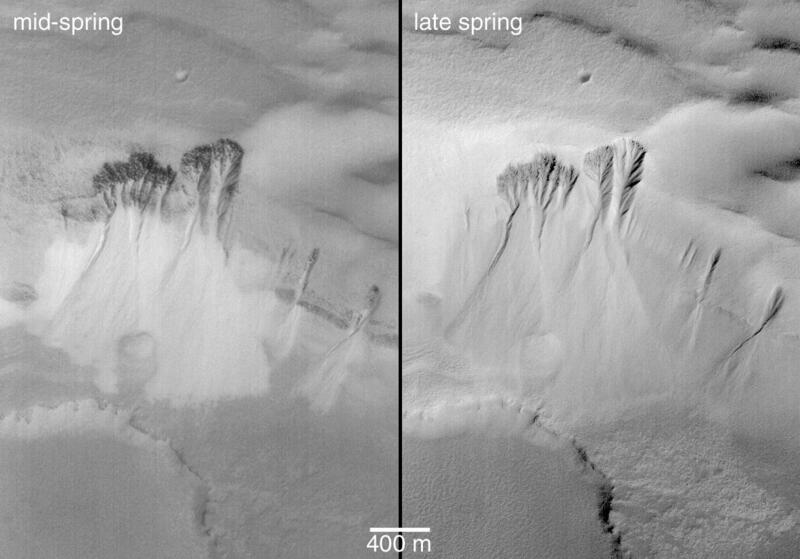 Southern hemisphere spring on Mars will begin this year around May 6, 2003. During the spring, the MOC operations team will be documenting changes as the seasonal carbon dioxide frost cap retreats southward. 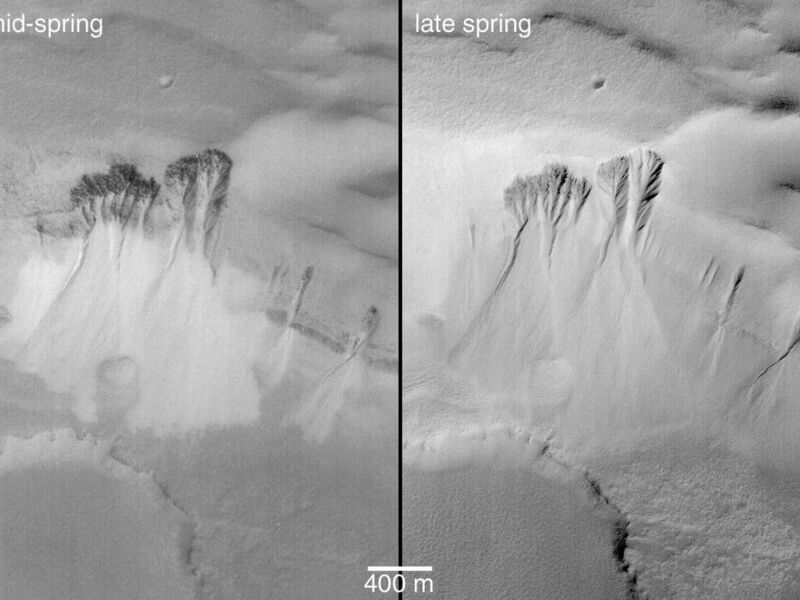 In preparation for this year's southern spring, the team has been examining images obtained during the last southern spring, which occurred in 2001. 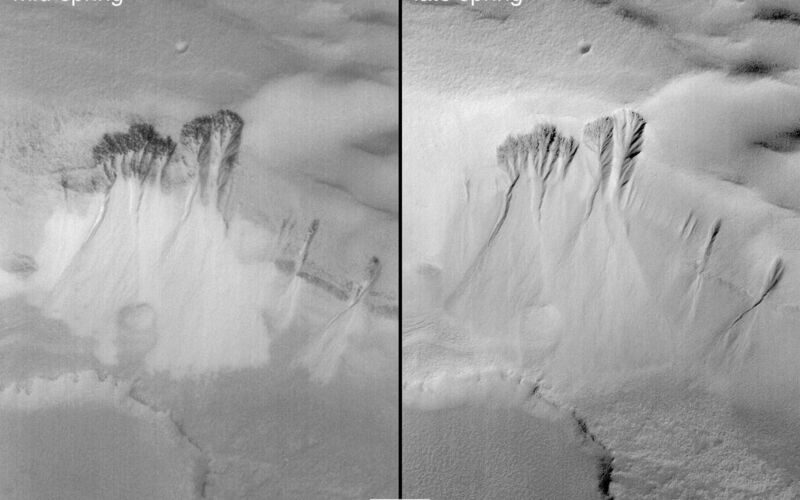 This pair of images shows gullies and associated scars formed by mass-movement down a slope in the south polar region. The first view, in mid-spring, was acquired in August 2001; it shows a terrain that is largely devoid of the frost that covered everything during winter. However, the aprons of debris from the mass-movements (landslides) are still frosted. 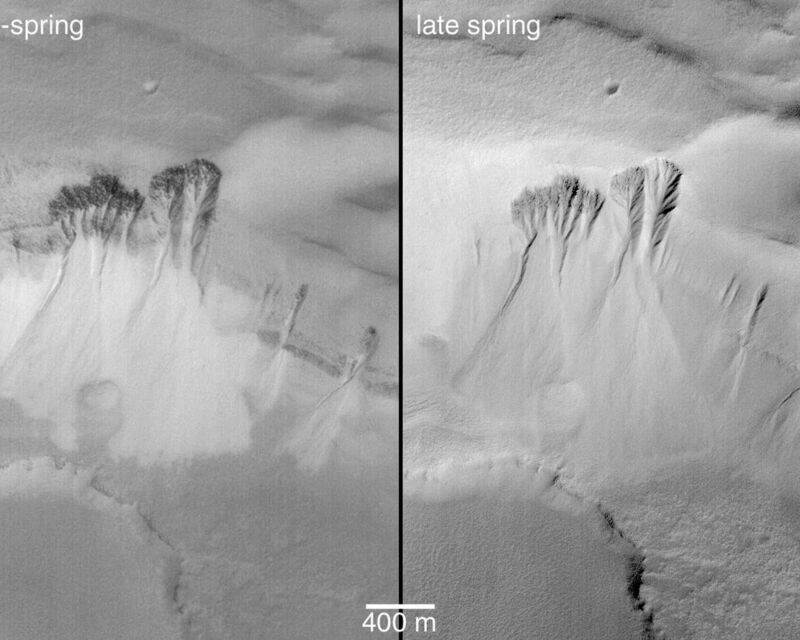 By late spring, in the second picture (right), the frost on the aprons had finally sublimed away, and the debris was seen to be not much brighter than their surroundings. The second picture was taken in November 2001, about a week before the first day of summer. The fact that the aprons of debris retained frost in mid-spring, whereas the surrounding terrain did not, probably indicates that the debris underlying the frost has different thermal properties than the surroundings. The debris might be more coarse-grained (sand or gravel, perhaps), and remained cooler in the daytime than the surrounding, dust-mantled surfaces. The images are both illuminated from the bottom/lower right. North is toward the bottom, and the area imaged is located near 70.9°S, 339.3°W.